An essential staple in any bathroom, our Toilet Brush & Holder offers value to the most budget-conscious businesses. 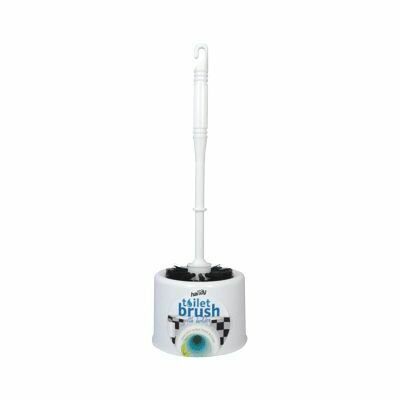 Made from a lightweight white plastic, this bleach-resistant brush comes complete with thick bristles for durable cleaning action. The extended handle keeps hands away from cleaning bleaches and toilet contents during use. The compatible holder can be used to store the brush when not in use while also holding chemical liquids during cleaning for the most hygienic results. Suitable for cleaning inside the bowl, around the rim, and underneath the lid, this toilet brush & holder makes quick work of your janitorial needs. For the cleanest bathrooms, toilets and WCs, consider adding our Gompels Concentrated Toilet Cleaner and corresponding Labels to your basket today. We also stock Pdcb-Free Urinal Deodorizer blocks and our own branded Strong Toilet Cleaner and Descaler for brilliant wholesale prices.